With the exception of The Incredibles, I’ve been skeptical about every Pixar movie that comes out. Then I’m always pleasantly surprised. And while Brave didn’t quite exceed my expectations of the studio the way Up did (which made me cry like a cookie-denied child) it still was quite good. My skepticism of these films stems from the fact that they’re so different from anything else I’ve seen. Why would a movie about a robot cleaning up a deserted Earth be any good? Wall E will show you why. How could yet another Toy Story movie 13 years after a sub-par sequel still be compelling? If you’ve seen it then you know. 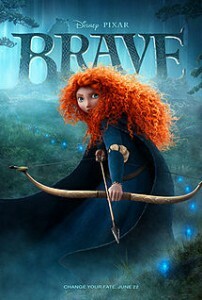 My skepticism of Brave stemmed from how familiar it looked. 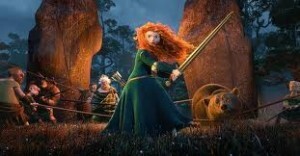 Merida can shoot an arrow better than any man! How progressive. She can make her own decisions and stuff. It’s an important point to make, but I always prefer themes like that to be just a part of a film and not the focal point. Thankfully, that turned out to be the case. Her rebellious nature isn’t so much the main point of the film as it is the launching point. In fact: it’s not that she wants to be “not a lady” so much as she’d like to be “not her mom.” Their relationship is the driving force of the film and though it’s nothing new, it’s still wonderfully done and very effective. Perhaps it would’ve been interesting to paint her mother as the rough arrow-shooting type and the daughter as the princess-y one. That would be fresh. What happens when the progressive glass ceiling-breaker grows up and has a child who isn’t like her? But people would never go for it because it “sends the wrong message” and “isn’t realistic.” Just a thought for Brave 2 is all I’m saying. Anyway, the main plot of the film is that her mom gets turned into a bear and this helps them grow closer. I know, right? Crazy! I definitely wasn’t expecting that, and I almost thought it was going to ruin the movie when it happened because it was so out of left field. But they made it work, like Pixar always does. By becoming a bear, Merida’s mother Elinor is essentially the exact opposite of the princess persona that she’s been instilling in her daughter. Bears embody freedom and individual power. They exist in nature and live dirty, yet carefree, lives. They’re also ferocious and dangerous animals that no one really wants to be around. There must be balance. At first, in what are probably the most amusing parts of the movie, Elinor tries to hold onto her Queen status. Seeing a bear wearing a tiara and curtsying is hilarious even for someone like myself who usually only laughs at jokes that no one else understands. Elinor needs to lighten up a little. 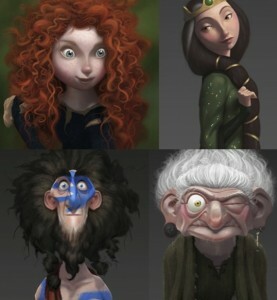 But as Merida finds out, being completely uninhibited isn’t good either. So in a very Disney way, the mother and daughter reconcile their differences and grow closer than ever. Spoiler alert on that last sentence, for those of you thinking it’d end with them hating each other and being passive aggressive at Thanksgiving. Well that’s the plot, but as we should all know: the lifeblood of a film often exists far beyond the plot. It’s the substance of the story and the delivery that stick with you. This is the first Pixar movie to feature predominantly human characters, so there’s a lot riding on it for the future of the studio (creativity-wise). Overall I’d say that people don’t work as well as animals within a movie of this type. I’ve pondered this in the past and come up with some (hopefully) interesting thoughts. Movies like this are trying to both make you laugh and tug at your heartstrings. Because non-cynical children love to laugh and still have heartstrings. So when you have a character like (literally just pulling one out here) Flick from A Bug’s Life, it’s inherently funny. Because it’s an ant talking to other insects. Stuff you normally think is gross is now amusing, which makes it even funnier. Then when his “humanity” shines through it’s all the more potent because you don’t expect it. We expect humans to act human. So they have to go above and beyond with their emotions within a film sometimes. We’re also wary of CGI people. They can’t be too realistic because that’s creepy. So they end up being caricatures and you can’t take them seriously. It’s kind of a quagmire. Which is why cartoon/CGI filmmakers usually avoid them. I’d say this film largely succeeds in using mostly humans. Or at least more than I thought it would. I did feel like there were two camps of people making it: one going for endearing comedy and the other for dark character development. So it does feel unbalanced at times. For the most part though, they manage to keep a tone that’s both light hearted and serious throughout the film. The people are at times cartoonish and humorous and other times frighteningly real. Some of the animations in the film with regards to human movement, even with something as simple as opening and entering a door, were very impressive. Many of the emotions that ordinarily would have to be conveyed solely through the voice actors were beautifully portrayed on the character’s faces. With regards to the scenery, I couldn’t tell whether the film didn’t have the usual array of beautiful landscapes or if I’ve just become desensitized to effects like that. After years of watching films like this or playing video games with sweeping and gorgeous backgrounds, I’m not sure I’d even notice such things anymore. Or at least notice them to the point where I’d stop and take it all in. I’d say some of it is that I’m used to beautiful computer-generated scenery by now, but there’s also the thought that this is largely a very personal and emotional film and thus might not benefit as much from big landscapes. The attention was instead given to the aforementioned facial expressions, which I’d say was a wise choice. The final major component of a great animated film is the voice acting. As always, it was fantastic. And for you Pixar fans: John Ratzenberger is indeed in it. I only know because I saw him in the credits. But he was there! Kelly MacDonald, who is impossibly both adorable and tough on Boardwalk Empire, stars as Merida and brings that same paradoxical fragility/ferocity to the role. After her you’ve got pretty much every recognizable Irish/Scottish actor in the business: Billy Connolly (The Boondock Saints, The Last Samurai), Craig Ferguson (How to Train Your Dragon, The Late Late [Late?] Show), and Kevin McKidd (Rome, Grey’s Anatomy) just to name a few. Elinor is played by the always stern-yet-delightful Emma Thompson (Love Actually, every Shakespeare adaptation). This great cast is what makes the film ultimately work. Because no matter how great the visuals are: the movie needs a soul. 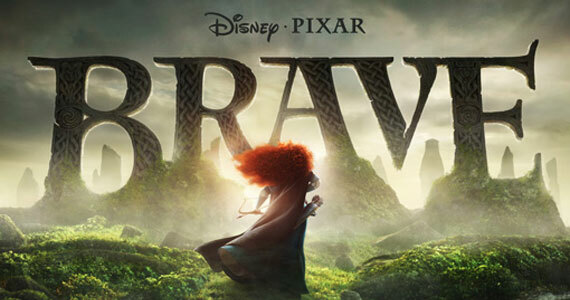 While Brave won’t make you laugh harder, cheer louder, or cry more profusely than many of its other Pixar brethren, it’ll still make you do all of those things. It shows us that the magic of Pixar is so powerful that even its “weaker” films are better than most things. And it reminds us that you don’t need to keep kids from the theater to keep adults entertained.